'Heritage is our legacy from the past, what we live with today, and what we pass on to future generations.’ United Nations Educational, Scientific & Cultural Organization (UNESCO). Be an outstanding example of the world’s geological history. Be an outstanding representative example of on-going evolutionary processes. Be of exceptional natural beauty. • Mulu’s concentration of caves, its geomorphic and structural characteristics are an outstanding resource, which allows a greater understanding of Earth’s history. • Mulu provides outstanding scientific opportunities to study theories on the origins of cave faunas. • Mulu has outstanding scenic values, including the natural phenomenon of millions of bats and swiftlets leaving and entering the caves is a superlative wildlife spectacle. • Mulu provides significant natural habitat for a wide range of plant and animal diversity both above and below ground. World Heritage status has created renewed interest in the park and a genuine desire of the government and people of Malaysia to ensure it is adequately protected. Accordingly, the Sarawak Government has committed to developing world leading conservation practices and high quality nature-based tourism activities at Mulu and has committed considerable resources to ensure its goals are achieved. 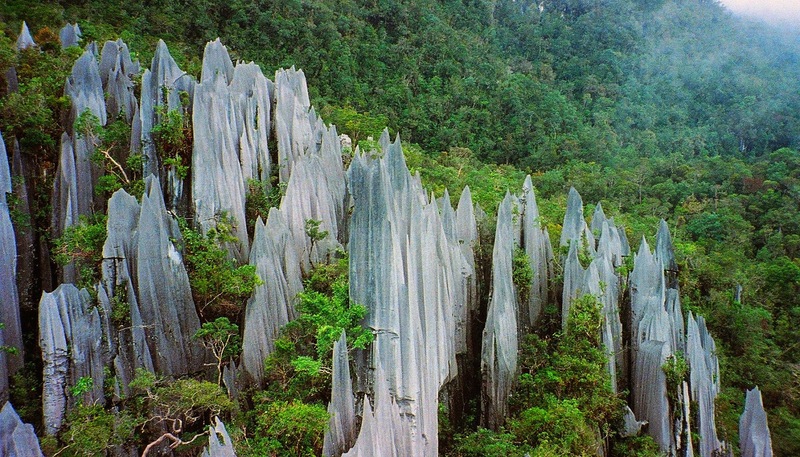 Situated among rainforest, crystal-clear rivers, rugged mountains and deep ravines, the park’s other remarkable features include the Pinnacles, a concentration of pointed, limestone spires, a karst sinkhole known as the Garden of Eden, and two majestic peaks, Gunung Mulu and Gunung Api. The park is also home to a number of wildlife species such as hornbills, bats, gibbons, barking deer and bearded pigs. In addition to guided cave tours and hiking, a popular activity here is walking high above the treetops along the world’s longest canopy walk. 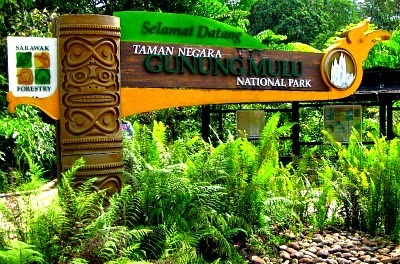 Because Gunung Mulu National Park is located in a remote area, the best way to access it is by air into the Mulu Airport. However, it is also possible to reach it by a combination of road, boat and hiking from Miri, although this can take many hours or days. Arrangements with tour guides will provide transportation and lodging.